LCHS partipates in the Time Travelers reciprocal membership program. Your Historical Society membership card provides you with FREE or Discounted Admission to 250 historic sites all across the country! For a complete list of participating sites log onto www.mohistory.org/content/membershipservices/timetravelers.aspx or call LCHS at 635-4035. As always you’ll enjoy local membership benefits including free admission to the Wilbor House and our special exhibitions, invitations to special events and advance registration for our most popular programs. 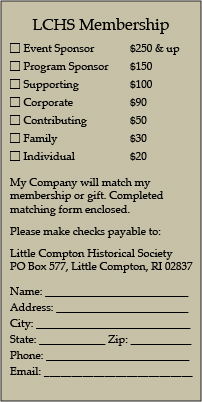 Most importantly, your membership gift helps preserve Little Compton’s rich history for generations. Can membership be obtained on line? No I’m afraid not. You can print the form out and send it in – or call us at 401-635-4035 Tuesday through Friday and we can take a credit card over the phone.